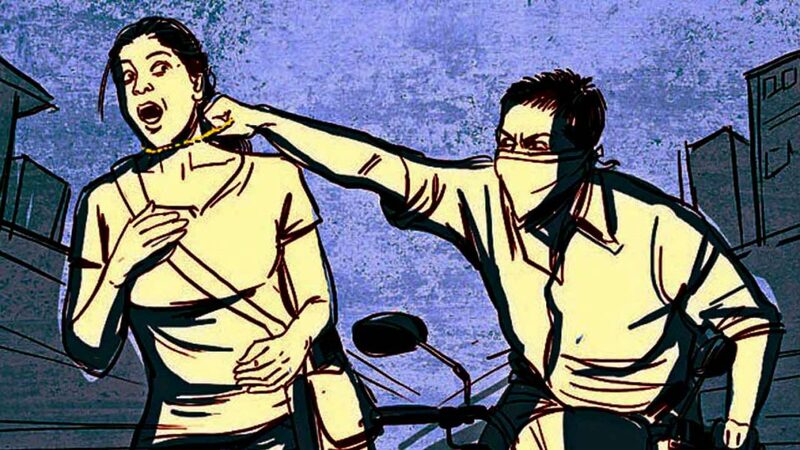 Unknown bike riders snatched gold chains from two women in Vadodara shocked the victims. Both of them are with their husband when the incident happened late night on Friday. Police is accessing the CCTV footage to trace the accused. As per details in the first incident Manjula Prajapati 57 from Manjalpur area was out for a walk with her husband at around 8pm last night. Much to her shock two persons on a bike rushed to her and snatched the gold chain she wear and fled from the spot. After one hour similar incident happened at Chhani road where the accused snatched gold chain from Nimisha Devekar 57 when she was out with her husband for a walk. The incident happened in two different areas in a hour time shocked the police and they believe the involment of same gang in both. They are trying to access the cctv footage to trace the accused and further investigating in the case.